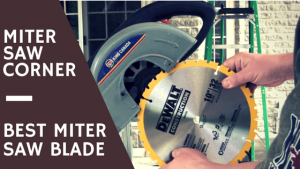 When searching for the best miter saw blade for your needs you’ll need to consider a few factors. Mainly, how fine of a cut do you need? A good rule of thumb is the more teeth, the finer the cut. The problem sometimes comes that with too many teeth, the gullets between them are small and you’ll need to slow your cut speed or you’ll risk the blade binding up causing a rough cut. The products I’ve chosen are on the higher end for tooth count and should be used for slow, smooth cuts. When used correctly, your results will be ready for use with a minimum of sanding. 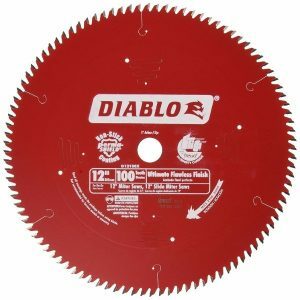 The Freud 12 inch, 100 Tooth Diablo leaves cuts so smooth you’ll swear someone sanded behind you. The blade can handle any aluminum, hardwood, plywood and even MDF without an issue. Steel and metal also provide very little resistance to this beast. This carbide blade fits most 12 inch mitre saws and after 3 weeks of regular use in my shop still held a very sharp edge. Just be sure you take your time with your cuts and allow the blade to clear the sawdust from the gullets and you’ll be making smooth cuts in no time making it ideal for crown moulding. 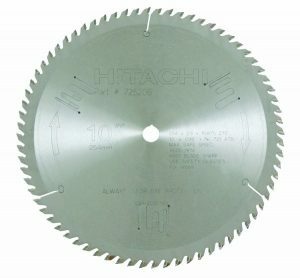 The 725206 from Hitachi will fit in 10-inch mitre saws and does a great job. With a 72 tooth, carbide blade you will be making very smooth cuts making this the ideal blade for fine woodworking and trim work. I was able to cut 1×4’s with no issue leaving not even the smallest splinter in the finished cut. These do tend to dull faster than others I’ve used so I’ve resorted to making everyday cuts with a 40 tooth blade and only pulling out the Hitachi when a fine cut is needed. It performs perfectly in this capacity. If you did want to use this product every day for all the cuts you make I’d imagine you’d need to have it sharpened or replaced within about 4 months of regular use. The Makita A-93681 is a 10-Inch, Carbide is one of the thinnest I’ve found. The kerf on this product measures at just .091″ which makes a very thin cut. I was able to use this on hardwoods, softwoods, plywoods and composites. It made short work of laminate flooring as well. There wasn’t much I threw at this chop saw blade that it couldn’t handle. The tooth hook angle on this blade is at 5 degrees. I never really paid much attention to that in the past but found that my mitre saw specifications called for a teeth set between 0 and 2 degrees, which I’m unable to find. Most other blade teeth are set to 7 degrees or close to it. I don’t know that it makes a big difference but the Makita just felt really good on cuts and never deflects. The pros can’t be wrong, this has to be the nr 1 contender for the best blade for the money. The bottom line with these chop saw blades is they are all well made and will get the job done as long as you use them correctly. 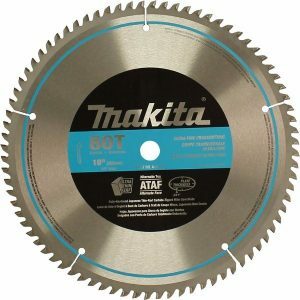 If I had to pick just one as the best miter saw blade of 2019, it would be the Makita A-93681 as it is priced a bit below the Freud blade and performs admirably. This blade from Makita will transform a good saw into a great one. I’d suggest keeping a number of different blades next to your saw stand if you have the chance. When cutting thick stock like 2×4’s or 4×4’s use a general purpose blade. But, when you need to cut 1 inch stock or thinner, pull out one of these fine cutting blades to make a cut you’d swear was already sanded. What do you think? Did we miss a favorite of yours? Do you only use fine or ultra-fine blades to make cuts? Let us know your thoughts in the comments below!